HIGH QUALITY AND DURABILITY: Tool made from Hardened treated Chrome Vanadium steel alloy (Cr-V), rotating tool head made from S2 alloy steel. HIGH TORQUE: Torque is 20% higher than the ordinary socket set. 6-point sockets grip flat sides of fasteners, not corners, preventing round off. The utility model is especially suitable for screwing bolts or nuts with very small or concave positions. 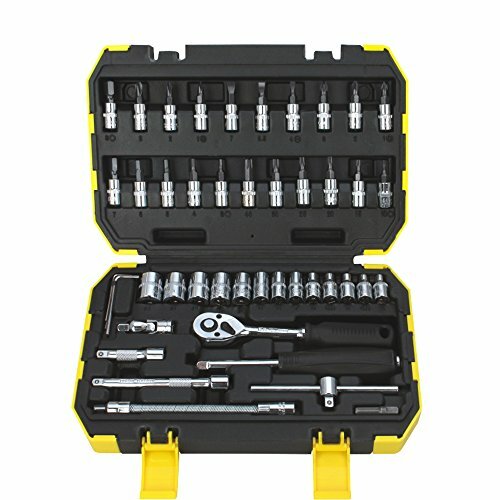 VALUE PACK: 46-piece socket set, professional designed for automobile maintenance. Includes 13pcs 1/4-inch 6 point sockets, 21pcs rotating sockets, 3pcs inner hexagon spanner, 1pcs 1/4 inch drive ratchet, 2pcs embossed short bar, 1pcs mirror slide bar, 1pcs mirror universal joint, 1pcs flexible joint, 1pcs AD changeover joint, 1pcs small square bar and 1 storage case. EASY STORAGE & HANDINESS: With A sturdy and good-looking plastic organizing case, total weight is only 1.75KG that easy for storage and handiness. If you have any questions about this product by BESTIRTOOL, contact us by completing and submitting the form below. If you are looking for a specif part number, please include it with your message.